The conference Judicial Reform in Ukraine: Achievements and Further Steps held in Kyiv on 1 June 2018 was organized under the auspices of the Supreme Court of Ukraine, the Judicial Reform Council, the Council of Europe, and the newspaper “Юридическая практика”. The conference was divided into four sessions: the first one was dedicated to the Constitution of Ukraine as the foundation of the independent justice, the second one dealt with the new Supreme Court of Ukraine, which is thought to pave the way to the rule of law in Ukraine, the third one related to the qualification procedures for the selection of judges, and the fourth one concerned the guarantees of independence of the judiciary in Ukraine. Some distinguished persons as Gianni Buquicchio, President of the Venice Commission, Hanne Juncker, Head of the Department of Justice and Legal Cooperation of the Directorate General of Human Rights and Rule of Law of the Council of Europe, Oleksiy Filatov, Deputy Head of the Presidential Administration of Ukraine, Valentyna Danishevska, Head of the Supreme Court of Ukraine, Sergii Koziakov, Chairman of the High Qualification Commission of Judges of Ukraine, dwelled upon diverse issues – resistance to changes from the existing judicial system, creation of the “electronic court”, peculiarities of the work of the new Supreme Court of Ukraine, its role as a “digester” and a “guidance” for lower courts. Thus, one could hear directly from the “architects” of judicial reform in Ukraine. Despite importance and interestingness of the matters discussed at the conference, we can’t help pointing out, though, some drawbacks of the highlighted issues. Jurvneshservice lawyers traditionally were and continue to be litigators; they are constantly practicing in courts of various instances of different jurisdictions. 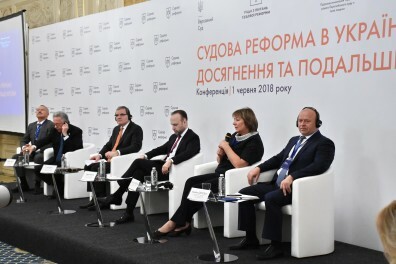 In our opinion the conference did not have enough connection with practical aspects of judicial reform in Ukraine: What should be done with the stagnation of the judiciary and the state similar to paralysis of the judicial system of Ukraine (that descriptions mainly concern the courts of the first instance)? How in that situation business, precisely business, not ordinary citizens, most of whom never get in touch with the judicial system, should trust such system and seek for justice in that system? How creation of the High Anti–Corruption Court will affect the entire reform of the judicial system of Ukraine? Sure, these questions are unfavorable and unwanted, however, they should be discussed, with involvement of primarily lawyers and practitioners. Nevertheless, Jurvneshservice welcomes such kind of events as the conference Judicial Reform in Ukraine: Achievements and Further Steps and hopes for the speediest reform of the judicial system of Ukraine possible, which will enable business to promptly and effectively protect its rights and interests.